Is it holding you back in your business or career? Shivani Bhagi, Helping professionals successfully advance or transition in their careers for more purpose, recognition & rewards. Impostor Syndrome; I’ve been hearing this term for quite some time in my entrepreneur circles and have seen its effects play out with many talented individuals. After learning of this syndrome I realised there are hundreds if not thousands of people in corporate who probably suffer from this too at some point in their careers. It’s very real and it affects more people than we know, many whom are high achieving individuals who somehow don’t believe they actually are as smart as they’re perceived to be. They secretly have a hard time recognising and owning their own achievements and have a high level of fear that they will one day be ‘found out’ and be exposed as someone who isn’t so smart or worthy after all. I see this a lot in the corporate space in my role as a corporate trainer and coach AND especially with women. I’ve coached many women who have underplayed their strengths and talents and who really couldn’t see the full extent of their own value or the impact they were capable of. As I pondered this ‘syndrom’ this morning, it hit me, I too have suffered from this back in the day when I was a corporate professional! I thought I’d escaped this one but no, I was not immune albeit I had suffered a milder version of this syndrome and it was thankfully a temporary experience for me. Back when I was in corporate there was a time when I had joined a new project and I was working with some of the best people in my industry. We were working on a very high level, high profile client account. I remember thinking everyone else around me was better than me and so much more knowledgable. I’ve always been an observant person and I started paying closer attention to the people and situations around me. I began to realise that they didn’t know more than me in ALL areas. Some areas, yes, without a doubt, but in other areas I was far more experienced, and more importantly effective than they were. One such area was when it came to building relationships with our clients. I had a natural ability to connect, read and extract the most important requirements of our clients and focus on delivering them. I observed that this was something, to my surprise, something MANY around me were unable to do. It just so happened that the project was failing because the relationship with our client was failing and I stepped in and stepped up to eventually help fix this. During this ‘impostor’ period when I didn’t feel I belonged or could contribute to the level everyone else could, I found myself holding back, second guessing myself and letting others take the lead in areas where I could have otherwise confidently handled. 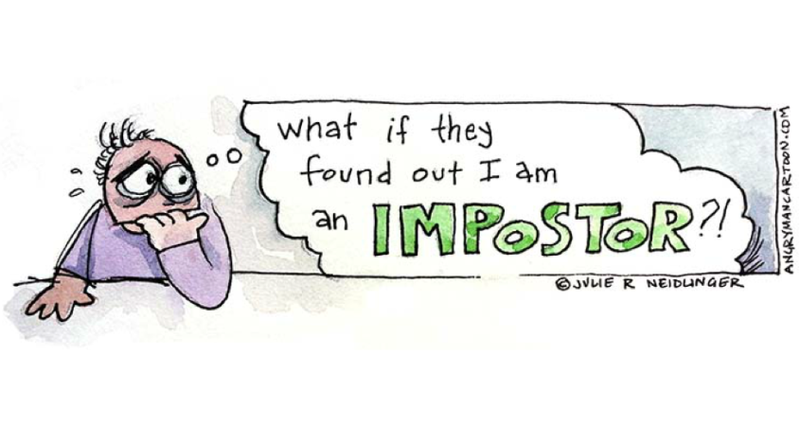 If you are someone suffering from Impostor Syndrome my advice is to start looking at things objectively and really observe what’s happening around you. Start documenting facts and soon, I’m certain, you’ll come to realise that no one is great in ALL areas and there will be certain areas where you naturally excel. Women especially have a tendency to underestimate the things they do well. Don’t. By uncovering the one or two things you do well and by capitalising on them, you can not only overcome any impostor syndrom you may have but truly forge a path for yourself and flourish on that path. True confidence really does come from understanding the value you bring and the impact you make with the things that you do well. It also comes from knowing you can and WILL contribute your best in areas that are less familiar to you or where others seem to know more than you, because in time anyone including you, can learn, apply and thrive. You are after all the making of your own thoughts and beliefs, so start today to challenge and change your beliefs one by one and empower yourself instead! Ready to advance or transition in your career? It’s never too late to redefine or repurpose your career! Shivani Bhagi is a Career Success & Leadership Coach helping professionals and entrepreneurs step up as leaders in their industries, create more alignment and make a bigger impact. With over a decade of corporate experience working with Fortune 500 companies and clients, today Shivani is an authority in leadership development and has facilitated over 250 workshops for managers and leaders across industries and global organisations. She has led multiple programmes both online and offline and has a particular passion for helping professional women succeed in life and business. Shivani is highly sought out by those who want better alignment in their lives and careers, who want to cultivate success in ways that matter to them and under her guidance her clients can expect to maximise their potential, impact & income.